Served up in a classic honey jar, this 16 ounce bottle of liquid gold combines the purest honey with the fiery heat of the Ghost Pepper. 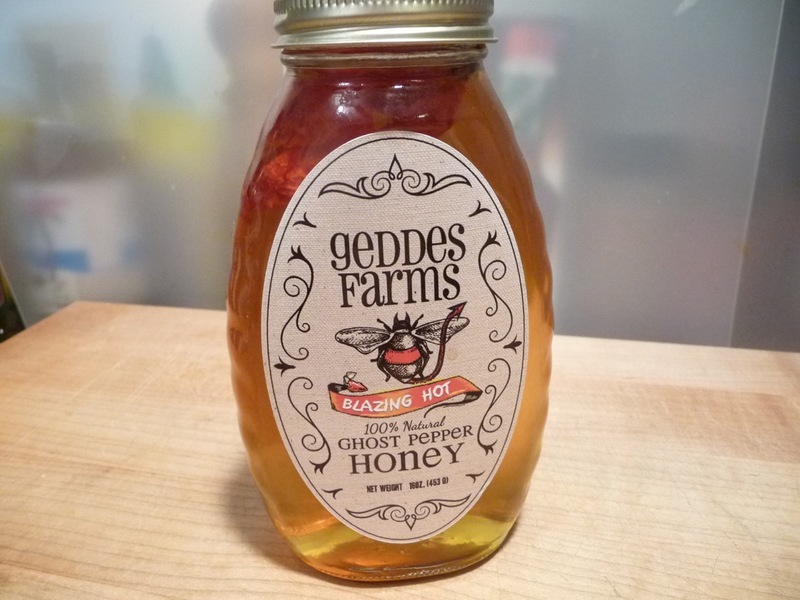 Geddes Farms of Maryland sent us a bottle of their raw honey infused with a Ghost pepper to sample. 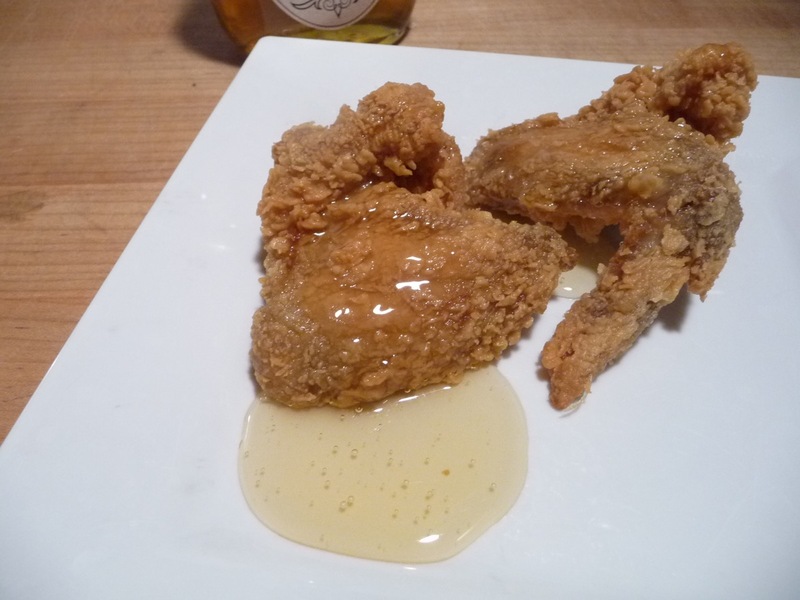 With its clear golden color, the flavor of this quality honey is enhanced by the addition of a split red Ghost pepper suspended in the honey. It brings a very pronounced heat to the sweet honey profile. Heat Level: – Big heat that hits you fast, but fades just as fast. Thrilling. Overall Rating: – Pure honey flavor with pure Ghost heat. Delicious. 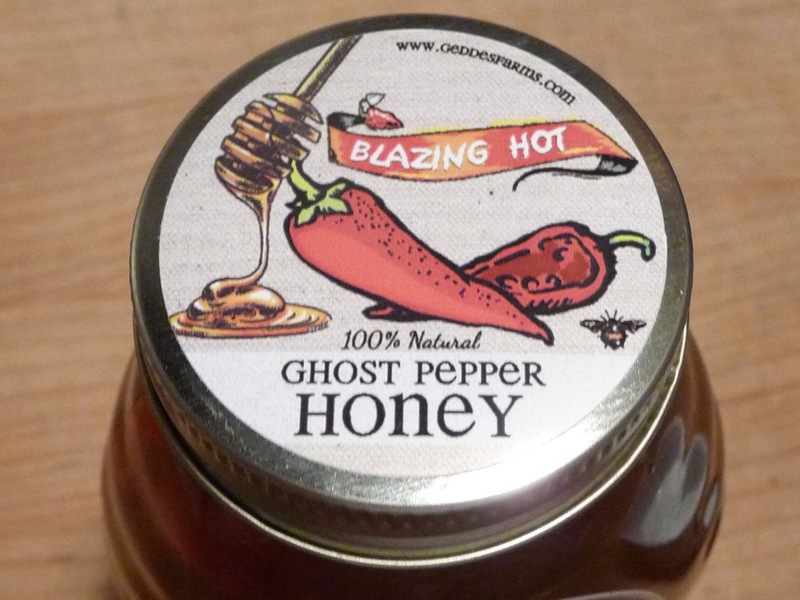 Some folks advocate honey as a way to reduce the burn of hot sauces and hot peppers, so I first thought it was just going to be one of those products that incorporated the Ghost pepper just to jump on the hot pepper bandwagon, but – oh my! 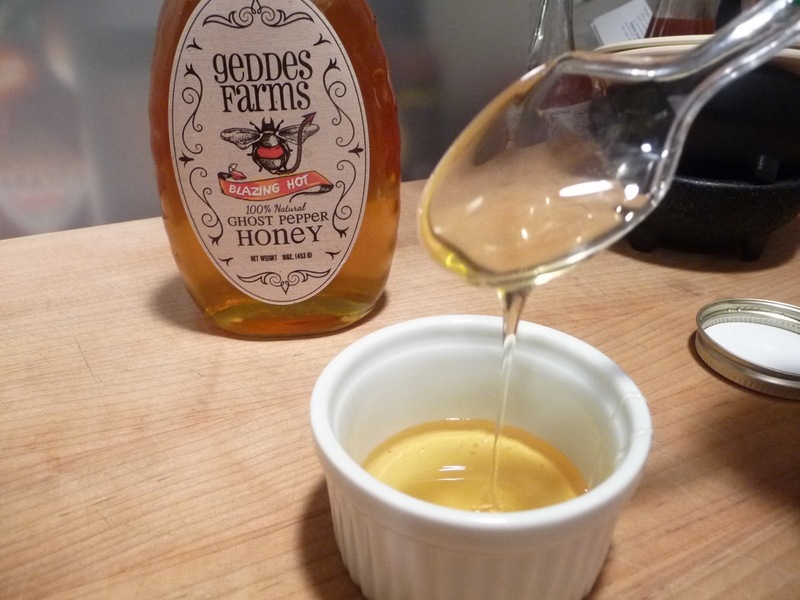 Geddes Farms Ghost Pepper Honey did not disappoint. 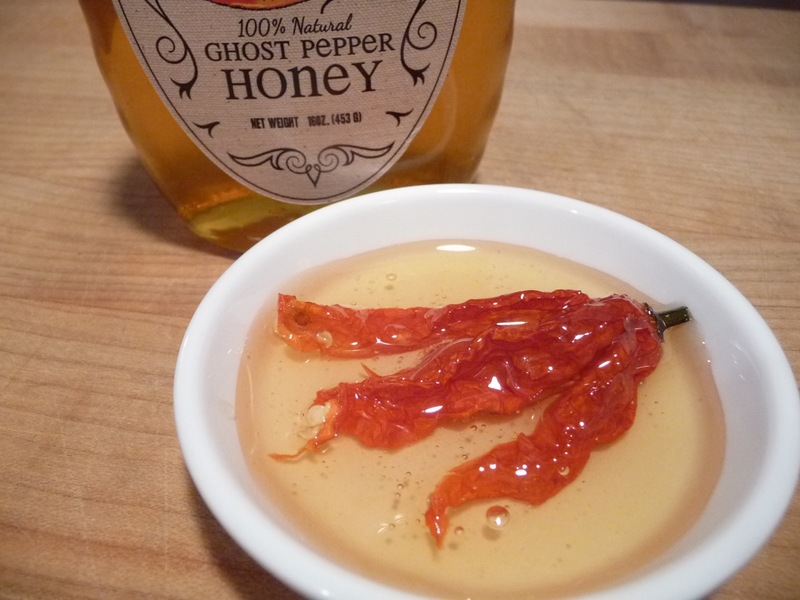 Ghost pepper in honey. Kind of creepy, huh? There is not nearly enough honey to cover-up the heat here, and that makes for a perfect combination of heat and sweet that any die-hard chilehead can appreciate. 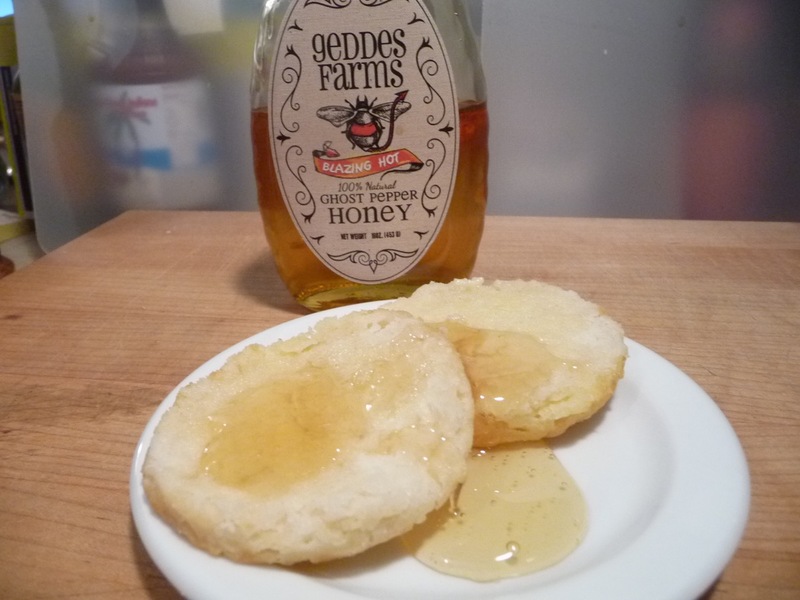 I’ve put Geddes Farms Blazing Hot Ghost Pepper Honey on just about everything I could think of – chicken tenders, wings, biscuits, peanut butter and honey sandwiches, and even on ice cream. I’ve yet to put it in my hot tea, but I will be using it to warm my soul when the winter wind and snow come knocking on our door. 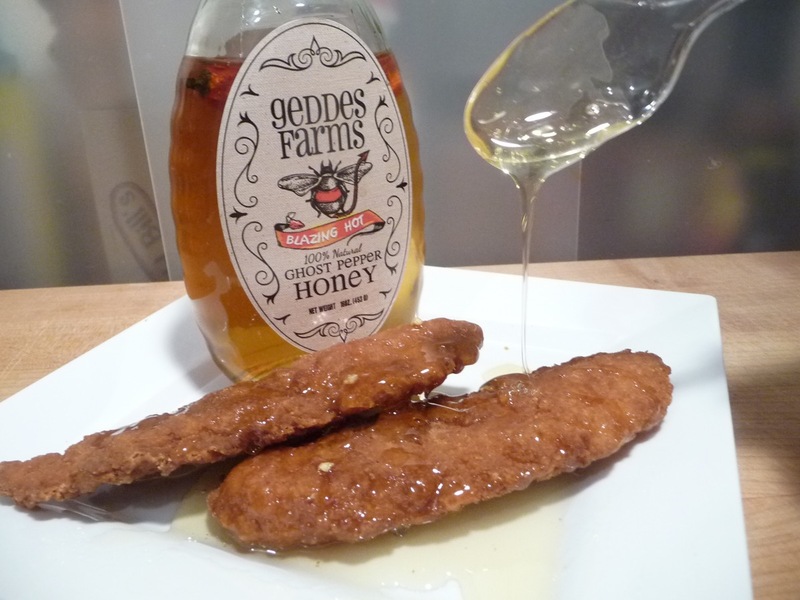 Geddes Farms Ghost pepper honey on chicken tenders. Ghost pepper, split for more flavor! 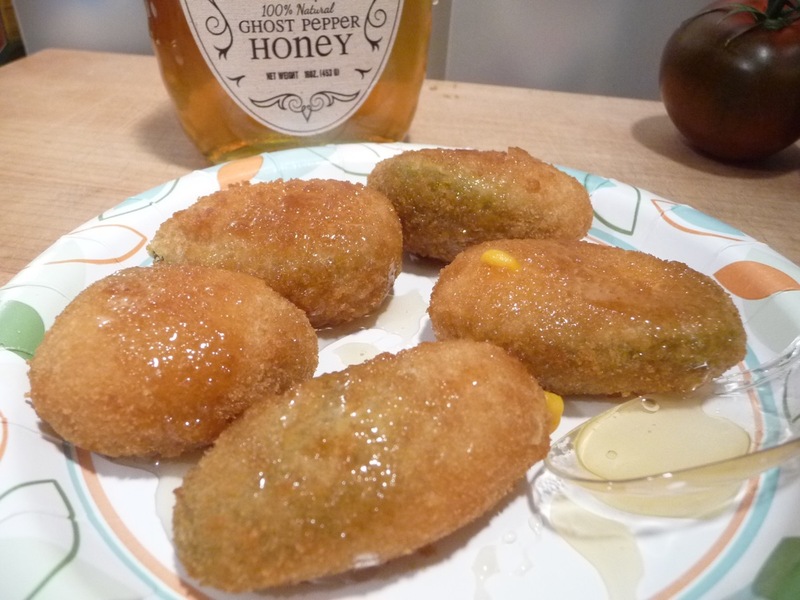 A sweet honey glaze on poppers. 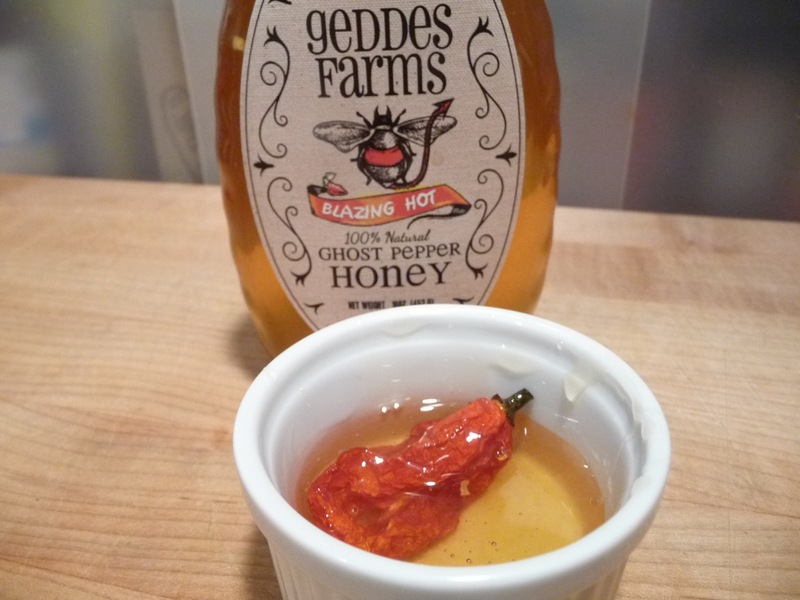 If you have a penchant for some heat with your sweet, or if you’re just a fan of honey looking for something a little different to please your palate, I highly recommend Geddes Farms Ghost Pepper Honey. Go here to place your order – you’ll be sooo glad you did! 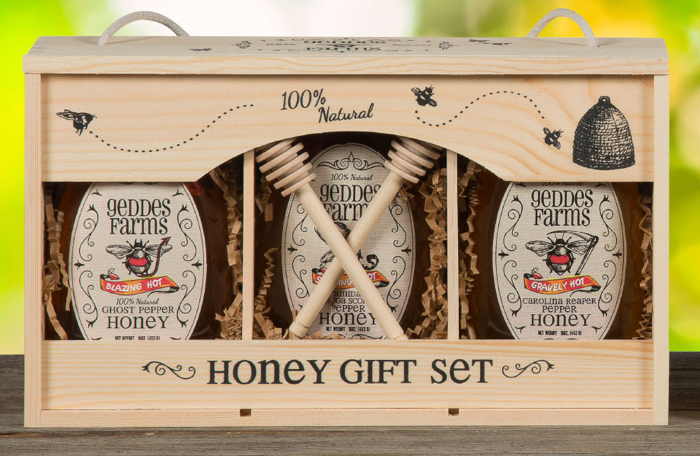 And check out all of their other honey products. Especially this awesome gift set for the chilehead in your life. 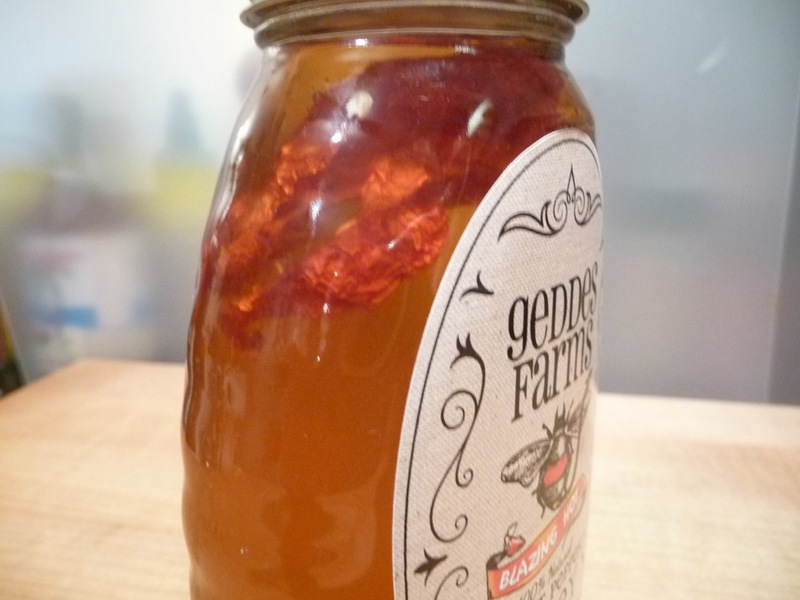 Visit: http://www.geddesfarms.com/ and tell them Marilyn from HotSauceDaily sent you! This would be very interesting used in place of regular honey in the wrap portion for doing competition ribs. I might have to play with this since I’m re-vamping my competition ribs for 2016. Interesting idea! I would probably try it with tea… but that might be really weird.